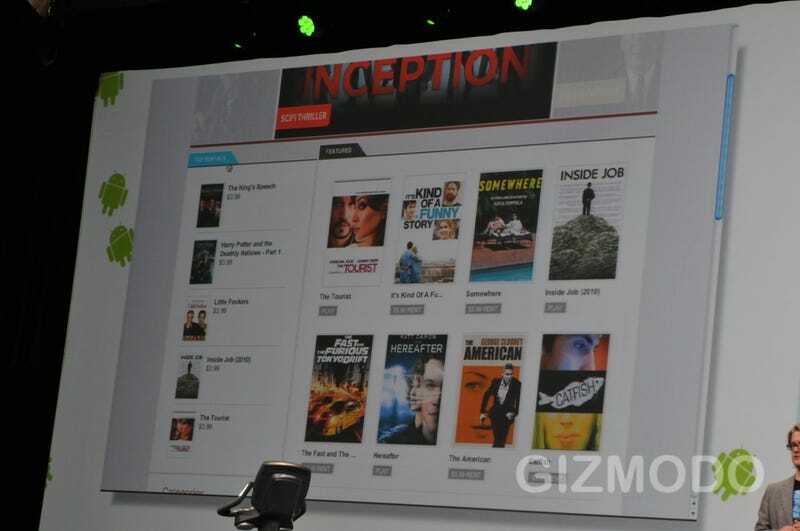 No longer are Android devices left out in the cold when it comes to movie streaming. Movie downloads have found a home in the Android Market, with thousands of titles available to rent starting at $2 a pop. The announcement came today at Google's mega I/O Conference. The terms of Android movie rentals seem pretty comparable to competitors like iTunes and Amazon On Demand; you have a 30-day rental window, although once you start playing a movie it disappears in a puff of smoke 24 hours later. There's also a Movies app that you can download to launch your content from, and you can rent "directly from the tablet"—which presumably means from the app. Google's introducing a handy feature called "pinning" to make the flicks more portable; instead of keeping The King's Speech strictly in the cloud, it'll download in the background and be ready to go if you don't have a network connection handy. The HD content pricing's also friendly, starting at $5. But when? Well, depends. The Movies app will be bundled as part of the Honeycomb 3.1 update. But for the Xoomless, the necessary Android 2.2 update will be coming in a couple of weeks.